How fast is the groundwater flowing? Will the contaminants move as quickly as the groundwater? Should the owner assume that these contaminants will not reach the edge of the property within the next 5 years? Should the owner be concerned about these contaminants in any other phases? 1. How fast is the groundwater flowing? 2. Will the contaminants move as quickly as the groundwater? Therefore, the distribution coefficient for Toluene is 1.96, and for Benzene is 0.54. Therefore, the retardation coefficients are 14.67 and 4.76 for Toluene and Benzene, respectively. 3. Should the owner assume that these contaminants will not reach the edge of the property within the next 5 years? Could they have reached the edge of the property already? Therefore, the concentration of Toluene at present is calculated to be 0.0 mg/L, and will be 0.0038 mg/L in 5 years. 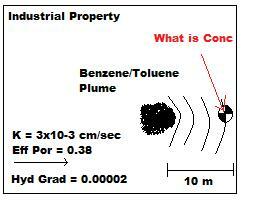 In addition, the concentration of Benzene at present is calculated to be 0.048 mg/L, and will be 0.83 mg/L in 5 years. They should be monitoring Benzene despite its lower source concentration as the retardation coefficient is much lower, and is therefore more mobile. Benzene has most likely already reached the edge of the property, and within another 5 years Toluene will also begin to appear in these waters as well. 4. Should the owner be concerned about these contaminants in any other phases? Therefore, the estimated concentration of Toluene and Benzene in the soil around the source zone is 10.52 mg/kg and 1.02 mg/kg, respectively. It is evident that the sorbed contaminants on the soil may also cause some environmental risks. In addition, should the area become unsaturated, there is the possibility of volatilization into the atmosphere. There are several tools available to calculate the risk of these, and many other possibilities. Two of these tools are included in the Risk Bundle. Freeze, R.A. and Cherry, J.A. (1979). Groundwater. Published by Prentice-Hall, Inc., Upper Saddle River, NJ. Sawyer, C.N., McCarty, P.L. and Parkin, G.F. (1994). Chemistry for Environmental Engineering; Fourth Edition. Published by McGraw-Hill Inc., NY. The GroundwaterSoftware.com risk bundle includes two risk based software packages; RBCA Toolkit for Chemical Releases and RISC.